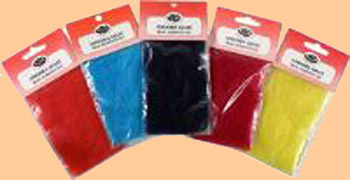 Dubbing is material that is wrapped around the thread and usually applied to the fly pattern as a body material. Dry flies generally require a fine textured dubbing while nymph patterns usually utilize a coarser dubbing with guard hairs present. Dubbing materials can be either natural or synthetic. A generalism exists that fur from land animals such as squirrel, rabbit, fox, etc. will sink more readily than water-based animals such as Muskrat, Beaver, Seal, etc. 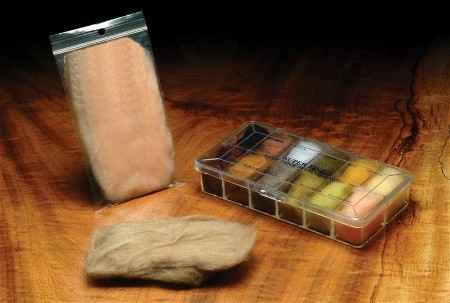 so that land animal fur should be used for nymphs and water-based animals for dry fly dubbing. This statement often does not hold true, particularly since most of the commercial furs have gone through a tanning procedure which has removed most of the natural oils. Some of your best nymphal and dry fly dubbings can come from either source. Pay more attention to the texture and color of the dubbing to suit your purpose. Many vendors supply blended materials with a mutitude of color shades. Natural fine dubbings especially good for dry flies are beaver and muskrat since they have a very fine structure. Hare's Ear and Squirrel make superb nymphal dubbings with their guard hairs present. Rabbit and Angora Goat make excellent leech-type flies since they absorb water and have long undulating fibers. 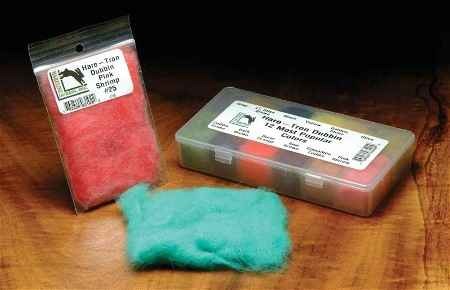 Small Family-owned company in Monroe, Oregon providing fly tying materials since 1981. 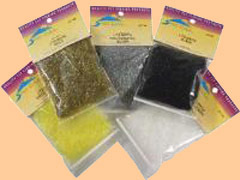 One of the largest providers of fly tying materials in the United States. Colors: Black, Yellow, Red, Brown, Green Damsel, Purple, Sand, Orange, Hendrickson Pink, Light Gray, Hot Orange, Chocolate, Olive, Peacock, Insect Green, Stonefly, Rust, Adams Gray, Light Cahill, Ginger, Hendrickson Nymph, Cream, Pale Yellow, Dark Olive, Hares Ear, Dark Hares Ear, Golden Brown, Amber, Olive Brown, Cinnamon Caddis, Rusty Orange, Light Olive, Caddis Green, March Brown, Dark Dun, Olive Dun, Olive Hares Ear. Colors: Bright Green, Green Highlander, Insect Green, Dark Green, Medium Olive, Dark Olive, Green Olive, Light Olive, Olive Dun, Golden Olive, Brown Olive, Dark Claret, Fiery Claret, Light Claret, Hot Orange, Fiery Orange, Crimson, Fiery Red, Fiery Yellow, Yellow, Light Blue, Kingfisher Blue, Dark Blue, Teal Blue, Magenta, Purple, Violet, Grey, Iron Blue, Blue Dun, Dark Grey Dun, Summer Duck, Gold, Brassy Gold, Fiery Brown, Dark Brown, Rust Brown, Cinnamon, Beige, Ginger, Black, White, Fluorescent Yellow, Fluorescent Red, Fluorescent Orange, Fluorescent Lime Green, Fluorescent Pink, Natural Seal. Spirit River of Roseburg, Oregon sells many dubbings. Lite Brite and Fine & Dry are probably their most popular brands. 19 colors available. Permanently waterproof. 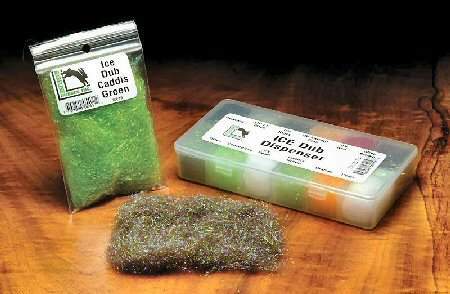 Good for dry flies and emergers. 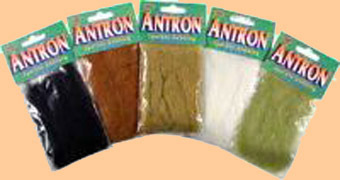 Blend contains very fine poly fibers with antron for highlights and sparkle. Can form very tight, thin bodies down to #28 and colors can be blended. 29 colors available. Permanently waterproof. 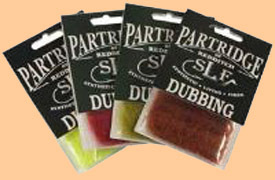 Very fine synthetic dubbing for small, tight bodies. Can be used on flies in the #24 to #30 range. Particularly usefull for small midge dubbing. 25 colors available. 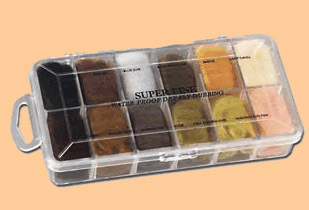 An all-purpose dubbing used mainly for nymphs and wet flies. Rabbit has guards hairs which give it a "buggy" appearance. 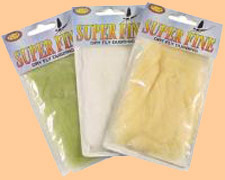 There are no natural oils to the fur and it does not have the properties of a dry fly dubbing. Colors: White, Cream, Yellow, Blue Dun, Grey, Tan, Ginger, Brown, Rusty Brown, Red, Light Olive, Caddis Green, Green, Olive, Brown Olive, Purple, Cinnamon Caddis, Black, Pink, Amber, Charcoal Grey, Squirrel Belly, Natural and Dark Olive. 33 colors available. 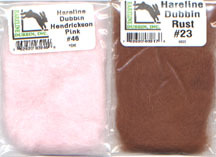 One of the most widely used materials in dubbing blends. Will add sparkle and hold air bubbles giving the fly a natural translucence. 25 colors available. Angora Goat is used as a seal substitute. Long fibers. Jay Fair of Susanville, CA is known for producing high quality products with very good dyeing colorations. Materials sinks rapidly and relects light like real seal. Denny Rickards patterns specify J. Fair's materials.